CLICK THE IMAGE to visit the ‘United America’ resource page where you can download a free copy of the 10 values. Americans have a lot of common ground. That is the central message of my new book, United America, which is officially launching today. Based on years of polling, I learned that Americans are united around 10 core values—strongly held principles that are shared across demographic, religious and political lines. The purpose of the book is to broadcast that message. For many Americans, respect for others seems to be on the decline. Respect in schools has dropped precipitously, according to a recent Harris Online poll. Comparing schools today with when they were in school, American adults say that students and school administrators don’t respect teachers. Teachers don’t respect students or parents, and parents don’t respect teachers. Is this your experience, too? But there are positive signs. For example, the vast majority of Americans say that all religious books should be treated with respect, according to a 2011 survey by the Public Religion Research Institute. A very large majority also believes that religious freedom extends to all religious groups, according to the same poll. A half-century ago, very few Americans supported black-white marriages, according to Gallup. Today, however, a very large majority of Americans do support it. We live in a diverse, multicultural society. In other places around the world, diversity spells disaster, everything from discrimination to systematic violence. In America today, the value of respect for others mutes any such tendencies. Is respect for others one of your core values? How do you practice respect for others? What do you do when you observe disrespect? CLICK THIS artful version of the list of 10 values. On our United American resource page, you’ll find that it’s a free download you can print and use in discussions. There also is a second, simplified version of the list if you prefer that. This evening, President Obama delivers his State of the Union address, the fifth time he has done so. One thing we’ll see is a display of American symbols—the flag aplenty, the elaborate protocol of the president’s invitation and entry into the House of Representatives, and more. How do you feel when you see these American symbols and rituals? Does seeing “Old Glory” stir your blood? Does hearing the national anthem do the same? Almost all Americans have positive feelings when they see the flag or hear the anthem. This is an emotional connection to country, a form of patriotism, and it is one of the 10 core values I document in my new book, United America. In an interview this week, I describe how this new book was developed and the vital role OurValues.org played in my research on civil dialogue. Today, we continue the overview of the 10 values. Do you love American symbols? What is your assessment of the State—and the Stats—of our nation? I grew up in a cloud of second-hand smoke. People smoked everywhere. It was a time when not smoking was abnormal. Now, smoking is banned in many public places, such as restaurants and bars. But a Michigan politician wants to repeal the ban, arguing that it infringes on our liberty. “Liberty” is the ability to do what you want without restraint—like smoking in public places. 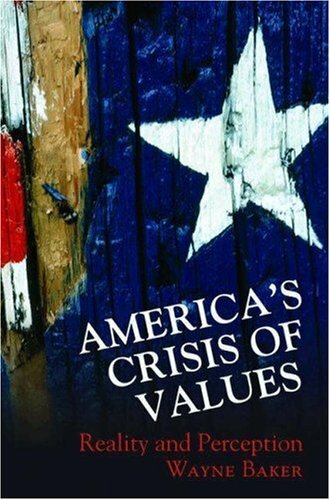 Many Americans believe in liberty, but not enough to qualify as a core American value. Rather, “freedom” is one of the 10 core values, as I discuss in United America. Since my new book was just published Monday, we’re using this OurValues.org series to introduce each core value and link them to contemporary issues. United America developed from a combination of my four national surveys of Americans and years of discussing values here at OurValues.org. Core Value 3: “Freedom”—as summarized in the chart of values, this one means “Having the right to participate in politics and elections; expression of unpopular ideas without fearing for one’s safety.” Freedom, then, comes with responsibility. This Michigan House bill that McMillin advocates comes 50 years after the first report issued by the U.S. Surgeon General that warned about the health hazards of smoking. Since then, we have made great strides in reducing tobacco usage in America, including bans on smoking in public places. Sustained outreach and education programs have reduced smoking. Smokers are now a dwindling minority. But there is still a long way to go. Some children and some demographic groups continue to light up. The economic costs alone are over $289 billion each year, according to a U.S. Surgeon General report published this month. Do you see the ban on smoking in public places to be an infringement of your liberty? THIS WORD CLOUD shows the most frequently used words in President Obama’s 2014 State of the Union Address. The bigger and bolder the term, the more frequently it was used in the speech. What priority do you give to keeping our nation safe and secure? Is it your top priority? National security is one of the 10 core values I documented in four national surveys and write about in my new book United America. When it comes to specific security issues, however, Americans can disagree, as we discuss today in this series on those 10 values. Security is a core value, but it’s not the #1 issue that Americans say is very important for the president and Congress to deal with this year, according to a poll earlier this month by Gallup. Now, the #1 issue is the economy. Nine of ten Democrats (91%) and Republicans (88%) say that it is extremely or very important that the president and Congress deal with the economy this year. You could hear this concern echoed in the president’s State of the Union address. The economy and related issues dominated his remarks. For Republicans, terrorism is the second most-cited issue—77% say this is a very or extremely important issue to address this year. The military and national defense comes next, with 76% of Republicans saying it’s a key issue. The same isn’t true for Democrats. Education is the second most important issue, with 91% of Democrats saying that it’s a very important issue to deal with this year. Poverty and homelessness comes third, with 82% of Democrats citing this as an important issue. Education is also important for Republicans, ranked #5 in their list of important issues. Seventy percent say this is something that should be addressed this year. But poverty and homelessness is way down on the Republican list, tied for 10th place with world affairs. Just over half of Republicans (53%) say poverty and homelessness is an important issue for the president and Congress to address this year. Do you think the economy should be the #1 focus for the president and Congress this year? Do you think Democrats should be more concerned about terrorism, the military and national defense? How important is it to you that we keep our nation safe and secure from external and internal threats? It’s a cliché to call America the Land of Opportunity but it’s a cliché that has a certain truth to it. Americans embrace the principle of equality but have constantly wrestled with its application. Take, for example, the minimum wage. In his 2014 State of the Union address, Obama argued for an increase in the wage. If you believe in equal opportunity, should you support raising the minimum wage? In other words, would a higher minimum wage result in greater opportunities for the wage earner? Economic outcomes (like the size of your paycheck) are clearly linked to opportunities. As a writer in The Economist put it, “Wealth is just distilled opportunity. Our opportunities are in no small part a function of our parents’ level of economic achievement—of their economic ‘outcome’.” Fast food workers understand the logic. If their wages keep them and their families in poverty, they can’t afford opportunities such as education for their children. Recently, we’ve seen walk-outs and strikes by fast food workers. Just a few days ago, fast food workers at the Pentagon had a one-day strike. Equal opportunity is one of America’s 10 core values. It’s inevitable that we wrestle with how to put into this guiding principle into practice. Despite the political controversies about raising the minimum wage, however, more than 75% of Americans favor raising it, according to Gallup. How important is the value of equality for you? Should we focus on economic outcomes to secure more opportunities? Do you favor or oppose raising the minimum wage? Cultural superiority + deep-seated insecurity + impulse control = success. That’s the latest formula for success, served up in The Triple Package: How Three Unlikely Traits Explain the Rise and Fall of Cultural Groups in America . That’s the new book by the wife-husband team of Amy Chua and Jed Rubenfeld. They are professors of law at Yale University. Chua is the “Tiger Mom” in her book about driving their children to succeed. What do you make of their success formula? The Chua-Rubenfeld book is an attempt to explain why members of some cultural groups get better grades in school, earn more money, and climb the social ladder faster than members of other cultural groups. The answer, they say, is the triple package of success. First, parents and their children believe that their particular culture is superior to others. Second, parents make their children insecure by driving them to achieve but never being satisfied with what their children achieve. Third, the achievers are good at “impulse control,” otherwise known as delaying gratification. Whatever you think of their thesis, it is true that getting ahead is one of the 10 Core American Values. Monetary success is a traditional indicator, but so is rising social status and mobility. The rub is that actually getting ahead in America is not so easy. Climbing the economic ladder is easier for citizens in several other countries than it is for Americans. But social mobility has not changed much over the decades, according to widely reported research by economists. What has changed is that the gulf between the lowest economic bracket and the highest economic bracket. Getting ahead can mean more than money. One can get ahead by pursuing a calling—working for a higher purpose—even if it doesn’t yield more money or status. A calling orientation is instilled by parents, according to new research by me and Kathryn Dekas. This gives parents another option than Chua-Rubenfeld’s prescription of superiority and inadequacy. Do you approve and disapprove of the “triple package” theory? What did your parents teach you about getting ahead?